Promotional value expires 180 days after purchase. Amount paid never expires. Limit 1 per person. Deal cannot be purchased with promotional codes. Valid within the US only. Starbucks Card eGift can be used in any participating Starbucks store. Must redeem Groupon voucher by expiration date. 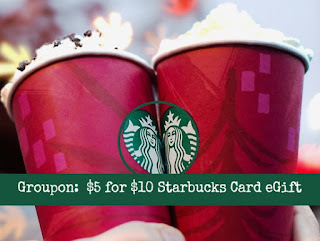 Groupon will send amount paid in Starbucks Card eGift if not redeemed by expiration date within 30 days. All sales final. See Starbucks Terms & Conditions applicable to Starbucks cards here. Starbucks Card eGift does not expire. See FAQ on this Groupon here. Merchant is solely responsible to purchasers for the care and quality of the advertised goods and services.